In the border town of Mae Sai is a nice hotel. 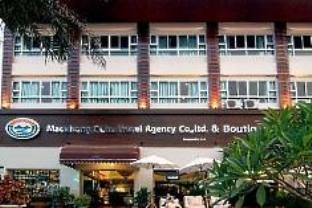 Maekhong Delta Boutique has nice clean rooms and is really good value for money. For around $50 AU you can have a large room with balcony and king sized bed (brekkie included). Tours to the local temples, across the border in Myanmar, are approximately 700 Baht and go for around two hours. Not bad, but there are better options for same money nearby. I was there in the low season...they were doing renovation, which was a bit noisy. Maybe their renovations will help? Bathroom too small and gets completely wet when shower. Stayed in 2 different rooms, both of which had leaks in the bathroom. The hotel is nice, clean, and spacious. The hallways were dimly lit, but otherwise things were as expected. Breakfast was slightly disappointing. The only real glitch is that the Google Maps pin for the hotel is not in the right spot. Otherwise a rather pleasant stay. Was noisy renovation work going on from 8 to 5. Bathroom too small. No bar soap provided. Water pressure goes up and down. Bed not very comfortable. There are better, newer places for almost same price. Lovely boutique hotel. Interior deco is beautiful and cozy. Room is clean spacious. Breakfast is normal. The staff are friendly. con. : location. 1. The hotel states in its story that it is in the heart of the Restaurant and Bar area, it is NOT its 4km from the centre of the town 2. Their is no transportation to the centre of town 3. The "manager"admitted that the story about location was not true and laughed 4. The bed was not as soft as the tiled floor. Ridiculously hard bed. 5. Breakfast very basic and served cold. 1 fry egg, 2 bits of sausage, 2 "slices"of ham, plus salad. Even luke warm would have been slightly acceptable. All taken into account the stay was very disappointing and I am giving fair warning to anyone thinking about staying there DON'T. Big room, good size bathroom, big veranda; quiet 99.9% of the time. Was cheaper and easier to pay on agoda than to try paying cash at desk. Breakfast sucked. I ate at Top North hotel by the border. Check in was minimal - they did not even check if we really had booking. The room was really very nice - very big and well presented. The bathroom was also good with both bath and separate shower. There was a long power cut during the evening - but there was an emergency torch in the room - but no electricity also meant no water as the water pumps did not work - so we could not take a shower until the power returned at 11pm. The TV has only Thai language channels. The buffet breakfast was supposed to be served 7am - 10am. We went at 8.45am and there was very little food left. There were 3 staff on duty who were not interested at all and only after we insisted one of them went out and came back with a tray containing a few ice cold fried eggs straight from the fridge. Overall, a very disappointing breakfast. Check-out was as minimal as the check-in - we just handed over the room key. The hotel provided poor service and the staff were not at all friendly. The hotel is OK for 1 night but I could not recommend a longer stay. We enjoyed it very much. Very friendly and helpful staff. We would recommend it to anyone. Great value. We happened to find and decided to stay a night here on a trip to Mae Sai. This hotel is just an easy one to stay overnight in case you need to. The hotel is a bid small and staffs are not very helpful. The good things are it's located on the main street only 4km from the boarder, and it's cheap.